North Bay Truck Center and A&T Road Service have added heavy duty towing to our overall list of services. We searched for the most flexible and useful rigs to tow the biggest trucks on the road, along with big buses, and large RV units. See some detail below about our latest truck additions. Our normal service area covers the best part of the bay area and Sacramento region; however, we now have capability to tow across the country if needed. Our A&T Road Service has expanded so much that we had to add towing to make it even more effective and timely. A&T Road Service, a subsidiary of North Bay Truck Center has just added the long-awaited Truck 32. This brand new 2014 Kenworth with a 500 hp Cummins and 18-speed gearbox is outfitted with an NRC Quickswap detachable tow unit with a tag axle for extra capacity. 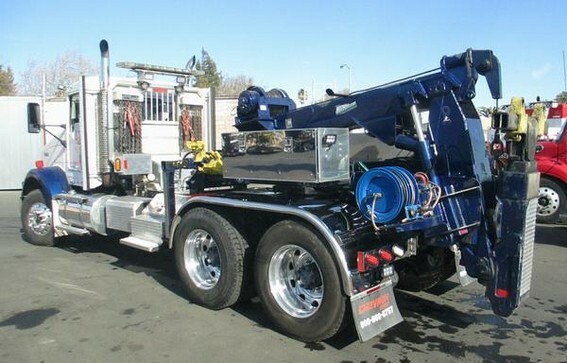 This allows the truck to be a wrecker and also a transfer vehicle, so with the unit disconnected, it will tow mobile home units, trailers of all kinds and with the wrecker unit attached is capable of lifting up to 20,000 lb steer axles for heavy duty truck towing. This unit can easily to HD trucks, buses, mobile homes. It is outfitted with tools and parts to make minor mechanical repairs, air line repair, fuel line repairs, add fuel, and can take care of any DEF needs. It is also equipped with extra high intensity lights for more effective and efficient night work, since A&T Road Service is available 24 hours a day. Adding a heavy duty truck and trailer towing service to our existing North Bay Truck Center full-service heavy truck service and repair shop, and A&T Road Service’s onsite 24-hour minor repair service seemed like a perfect fit. It has proved to be true. We are adding to our fleet of tow trucks and outfitting them for maximum flexibility to handle almost any job. We also offer short and long distance heavy duty truck and trailer towing. Whether it is across the country, state to state, anywhere in northern California, or here locally in Solano County, we’ve got you covered. North Bay Truck Center is centrally located in Fairfield CA to service all of Solano County along with much of the San Francisco/Oakland bay area and Sacramento. Above is our HD Kenworth tow truck number 30 with the Holmes D.T.U. (Detachable Towing Unit). This proven design and technology comes from the most trusted name in the towing industry. The front legs allow the unit to be easily removed in a matter of minutes so the truck can be multi-functional for both towing or pulling trailers. It has a lifting capacity of 16,000 lbs when extended and will extend up to 113 inches past the tailboard. The newest addition to our tow fleet is truck number 32. This is a 2014 Kenworth with a Cummins 500 hp engine and 18-speed transmission. 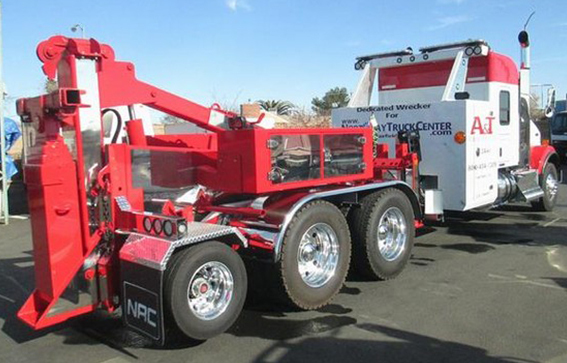 The working end of this mighty tow vehicle is the NRC Quickswap unit with tag axle. This unique design will allow us to tow almost anything on the road. We can now lift up to 20,000 lb steering axle trucks, and also buses and large RV units. The long wheelbase and the tag axle combine to allow us to tow a wide variety of units. In addition, this truck is well suited for short and long haul jobs. With the sleeper unit, we can tow across the country if needed, or for local jobs the sleeper will accommodate extra passengers. The unit is equipped with state of the art LED lighting to light up the are needed in the night, as well as tool, equipment and parts storage to take care of small repairs, DEF issues and much more.